Richard L. Sherman, the owner and chief designer at Appropriate Designs has been involved in the construction trades as craftsman and designer since 1975. He has worked as a carpenter, mason and general contractor as well as designer and construction manager on passive solar and earth sheltered residences. Sherman attended the Boston Architectural Center as a professional degree student for six years. 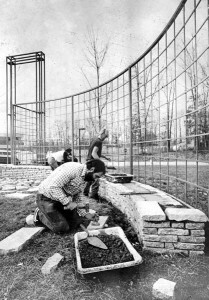 While at architectural firms Lawrence and Associates of Manchester, CT and Kubitz and Pepi of Wellesley, MA., he worked on multifamily housing, park and ride facilities and the Northwest Airlines terminal at Logan Airport as a designer and draftsman. As a mason he has designed and constructed Trombe Walls, Russian Masonry and Finnish Contra Flow Masonry heaters as well as Rumsford fireplaces. He has also designed and provided construction management services for the MotoConsult Motorcycle Showroom constructed with energy efficient Structural Insulated Panels (SIPS) and glulam engineered beams and columns. Sherman was also involved in the predesign and programmatic review and preliminary and schematic design phase of the Willimantic Food Coop’s Valley Street store. 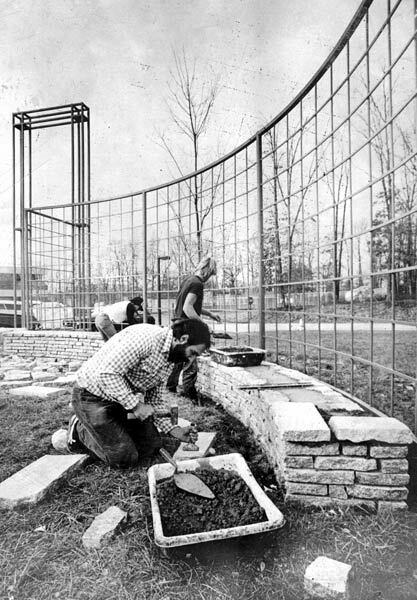 The photo on the left shows Richard working on the Eastern CT State University North Campus Garden Wall. Sherman has kept current with the rapid evolution of solar and green architecture by his association with Peoples Action for Clean Energy (PACE), Northeast Sustainable Energy Association (NESEA) and the American Solar Energy Society (ASES). He is also a member of the Connecticut Council on Environmental Quality (CEQ), having been appointed by the Speaker of the CT House of Representatives. Appropriate Site Orientation We site buildings with respect to solar orientation, prevailing wind direction, elevation contours and environmental impact on flora and fauna. Use of Appropriate Building Materials We specify the use of non-toxic building materials. To the extent possible we employ natural local, recycled and green certified building products. Energy Efficiency We generate passive solar, earth sheltered (tempered) and superinsulated building designs. We promote the use of solar heating and cooling systems, daylighting and the site production of electricity through the use of photovoltaic cells, panels and arrays. Use of Appropriate Scale We scale buildings correctly to fit your spatial needs. Our designs are characterized by effective internal organization, phased construction and three season space utilization. Our designs embody the less is more philosphy vital to green architecture. what are the characteristics of the site or existing residence. Armed with this information the designer then proceeds with several concept sketches. These sketches are reviewed with input from Energy-10 software, design professionals and contractors for energy efficiency, solar orientation, non fossil fuel heating and cooling system opportunities, building envelope alternatives and cost and integrity of construction issues. The interior arrangement of rooms must allow for the public, semi public and private spatial needs of the folks utilizing them. Circulation, both horizontal and vertical, both internal and to the outside must be coherent and efficiently organized. Upon completion of these reviews with the assistance of the designer, the client selects one of the sketches for development into what becomes the construction drawings. Another important facet of the team approach is the early and continuous involvement of other design professionals and trades people that we have worked successfully with in the past. Our projects and clients throughout eastern Connecticut who have been the beneficiary of our work are glad to offer their observations and endorsements for your consideration. Appropriate Designs believes in what is called the democratic design process. By this we mean regular and early designer and client interactions (meetings, conversations, review of work). To us this is the core of custom design. Without this involvement, achieving the client’s building goals and aspirations becomes very difficult. Furthermore such interaction keeps the design process on track and eliminates costly and time consuming design dead ends and the frustrations they engender. Whether the project is new home construction, a renovation, addition or a consultation we are firm believers in the team approach. It is our belief that early and continuous client involvement is essential to a good outcome. Chief Architect 2D and 3D software produces drawings and renderings that make possible accurate depictions of various design proposals and hence aid meaningful client involvement.